The formation of children's fundamental capacities is hugely important during the first years of life - not just academic learning but the ability to concentrate, persevere and think for themselves as well as the ability to interact well with others. Children who have been given the right kind of support during these formative years grow into adults who are self-motivated and love learning, can think flexibly and creatively and who are not only conscious of the needs of others but actively foster harmony as they go through life. In traditional education adults decide what children need to learn and the ability to retain and reproduce information is used as a measure of academic success. The teacher is the active giver of information and children are passive receivers. 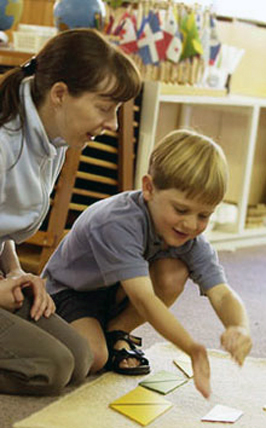 In the Montessori approach it is all about the activity of the child. The teacher takes on a different role, that is, to provide the right kind of circumstances so that children can be guided to find what they need from what is on offer. Children then become active learners and are able to reach their own unique potential because they are learning at their own pace and rhythm focussing on their own particular developmental needs at that moment.